Kelly Gardner has joined Mickey’s Engineering Team as Manufacturing Engineer, responsible for manufacturing process improvement and project management. He reports to Noel DiBona, VP Engineering. 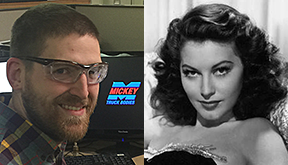 Prior to Mickey, Kelly was a Manufacturing Engineer with Greensboro, NC-based Gilbarco Veeder-Root, the worldwide technology leader for retail and commercial fueling operations. Before that he was a Manufacturing Engineer Hubbell ICD in Archdale, NC, and was also a Quality Engineer BMW MC USA. Kelly earned a Bachelor of Science Degree in Mechanical Engineering from North Carolina State University in 2004. “Mickey is an interesting mix of manufacturing processes and design innovation, and for me that means an exciting new challenge that I’m looking forward to,” says Kelly. Speaking of interesting, Kelly is related to the late Ava Gardner, legendary actress from the “Golden Age” of Hollywood; Ms. Gardner and Kelly’s grandfather were first cousins. The Gardner’s are planning a family reunion next month at the Ava Gardner Museum in Smithfield, NC.